The sun is quickly setting on this garage sale season, a fact that, quite honestly, makes me very sad. 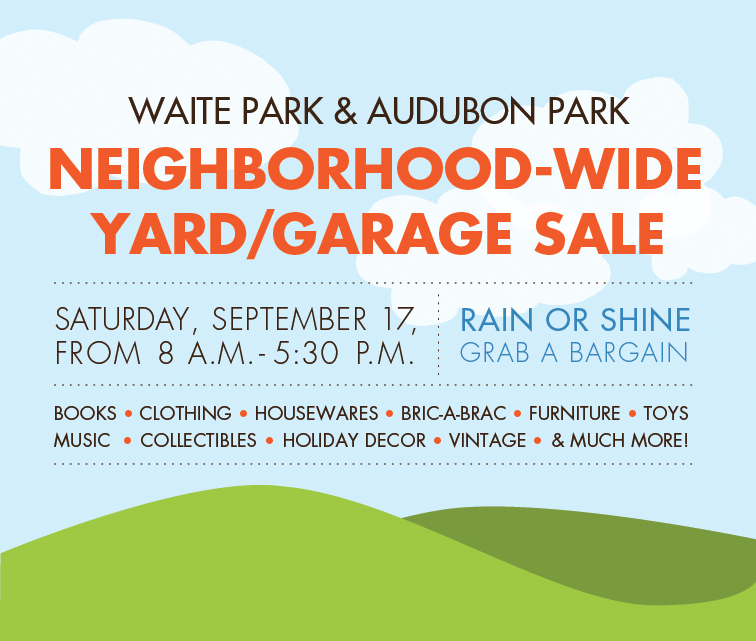 Fortunately, the lovely residents of the Waite Park and Audubon Park neighborhoods in Northeast Minneapolis are squeezing in one more community-wide sale this Saturday from 8 a.m. to 5:30 p.m. Heading up the organizing committee for this event is my friend Rose, a fellow garage sale-ing addict and vintage lover, who was kind enough to share some insider info about the sale. Me: Rosie! Tell me why folks should get up early on Saturday and come to these sales? Rose: With more than 40 households participating, there will definitely be fun bargains for everyone. It’s also the last hurrah for garage sale season! Get out and enjoy the crisp weather and start feathering your nests for winter. Me: What can people expect to find at this year’s sale? Rose: Vintage clothing, objet d’art (a.k.a. bric-a-brac), housewares, computer stuff, records, mix tapes, art, house plants, perennials, collectibles, clothing for the whole family, horn of plenty, gadgets, widgets, what-nots and why-nots, fact, fiction, tall tales and short stories, tools, treasures to a two-year old and more. Covet-able items of particular interest include a Formica dining table, vintage clothing for men and women, Heywood Wakefield furniture, antique school desks, an espresso coffee maker, perennials, Mission-style entertainment center. Me: Sounds awesome! Where can I get a sale directory? Rose: Directories will be available on Johnson Street at Hazel’s and The Coffeeshop NE, as well as at the Northeast Library, the Eastside Food Co-op and Holy Land. You can also print one from the comfort of your own home. Here’s the link. Me: Coffee and food make garage sale adventures more fun. Where can I go to get good coffee or brunch? Rose: If you are heading down Johnson Street, Coffee Shop Northeast is the perfect place to pick up some to-go coffee. Pair it with some donuts from Sarah Jane’s Bakery across the street for the perfect fuel for your early morning shopping. Post-shopping, sit down to a tasty brunch at Hazel’s—I recommend the brisket hash or Ben’s black bean cakes. If you are starting on Central Ave., get your caffeine fix at Diamonds Coffee Shoppe or the Eastside Food Co-op. Enjoy some of the best Thai food in the city at Sen Yai Sen Lek or have an amazing brunch at Chimborazo, an Ecuadorian restaurant. I highly recommend the llapingachos—loveable cheese-filled potato pancakes. So, there you have it. The perfect Saturday morning agenda. See you there, sweet readers! This entry was posted in Uncategorized and tagged garage sale, garage sale-ing, heads up, Northeast Minneapolis by highplainsthrifter. Bookmark the permalink.